"The new analysis, "Women's Health & Abortion," explains that maternal mortality fell dramatically in developed nations as a result of mid-20th century improvements in health care—well before the widespread legalization of abortion. Today Ireland and Poland, which prohibit most abortions, boast among the world's lowest rates of maternal death. [...] Chile's success contrasts with the recent record of the United States, which permits abortion on demand and has seen its maternal mortality rate climb upward over the last two decades. The U.S. maternal mortality ratio (the number of deaths per 100,000 live births) increased from 10.3 in 1999 to 23.2 in 2009. Over the same period, Chile's ratio decreased from 23.6 to 16.9. A report issued this month by the World Health Organization and other U.N. agencies estimates that maternal deaths worldwide dropped 47 percent from 1990 to 2010. The report offers further proof that women’s lives can be saved through improved health conditions." Like I said, healthcare conditions, not the legality of abortion, seem to be the deciding factor in reducing maternal mortality. That's why US abortion deaths were dropping long before Roe v. Wade, and that's why Chile saw a reduction in maternal mortality rates even though abortion was re-criminalized. Never mind that wasting resources lobbying for abortion "rights", when you could be spending money and time helping to bring healthcare systems out of the dark ages, is just bad policy. Why would you advocate for abortion access when the healthcare systems are in disarray? Abortions are not simple procedures and I could see more deaths occurring simply because women are having abortions from untrained professionals, with tools that aren't sterilized, and equipment that isn't up to date. And what about all the other people who are dying because of poor access to healthcare? Their lives clearly won't be saved by abortion legality. 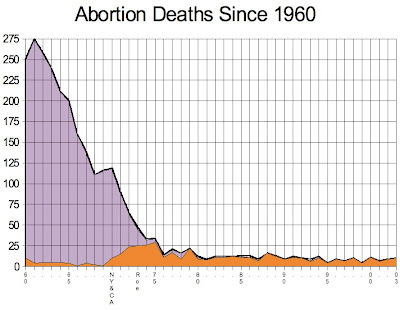 Pro-choicers: if you are so worried about women dying, deal with the things that are directly causing their deaths. One last thought, which I got from Jennie from LiveAction, is that if women are dying from illegal abortions, it is the pro-choicers who are killing them since pro-lifers (obviously) don't do abortions. Interesting point, and it really hits home to me the real tragedy of abortion, which is that in a society that focuses so much on "pro-choice", the only option that seems to be discussed at length is abortion - women are very often not given or encouraged to consider other choices. It is one of the reasons PP performs so many abortions vs. adoption referrals. It really is a tragedy, and it is a sign, like Feminists for Life says, that we as a society are failing women.